Views from the loch. : A view on “What’s wrong with Pike fishing”? Clearly there is much wrong with it, but not the actual sport rather those who claim to be bona fide participants of the sport! The angling press and countryside journals report on a frequent basis the deviant behaviour of some that lay claim to be anglers! All sports have their Noddy contingents but with Pike fishing the sport appears to be over endowed with these Muppets! People like Dangerman who do not appear to be able to think probably damage the sport more than any other kind of Muppet! You see a good percentage of drunkards, litterers, Neds and arsonists can be brought to book and their behaviour corrected after some remedial realignment by a relevant authority figure. Dangerman types unfortunately are able to bypass this checkpoint because you cannot be arrested for being an imbecile! The Dangerman types cannot reform because they are too stupid to understand that they have done wrong and just perpetually pick up and start again on the never changing treadmill again completely oblivious to the damage they are doing. I know that it is not politically correct to round on these types, but it is completely infuriating when our sport is put in danger by these unthinking Noddys. I’m not sure what the answer is from an educational point of view, because since they have not the ability to understand how then is it possible for them to learn? In direct contrast many of the everyday clowns after correction often respond to a rebuke and gradually the miscreants are redirected back on the straight and narrow! Pike fishing in particular seems to carry with it a macho image of the hunter overpowering one of nature’s biggest predators! That the Pike is a voracious predator in its own environment is not in dispute. But remove it from its environment (water) and it has the resilience of a 3 month old human. The macho and the Dangerman types are unaware of this and many other important issues and as with a whole host of things it boils down to a lack of education! It is maybe this he man attitude that leads to the atrocious handing as displayed by Dangerman, and what is the root cause of this? Quite simply again it is a lack of education! You will note in Dangerman’s schoolboy like comments on You Tube that he states the Pike in the video was his first in ten years. Not really a plausible excuse Dangerman, many right thinking anglers returning to the sport after a break firstly read up on what the latest developments are, the reasons for them and how to go about implementing them. Clearly Dangerman made no attempt to research his sport he puts nothing in to his sport, how hollow then to pose with the creature he has mistreated whilst she struggles to get oxygen vital to her survival! I mean you could even go on one of the forums (not applicable to you Dangerman) and ask for views from the more experienced contributors or engage in discussion with some of the real anglers often found fishing at our lochs! What kind of angler in these more enlightened times blunders in and mutilates his quarry, demonstrates despicable handling skills then to compound matters videos himself and posts it on a publically viewable site? I will tell you only a crass buffoon of the highest order with no idea of the consequences of his actions would do so! It is these simpletons as opposed to the common or garden Noddys that present the greatest danger to angling! It would be my wish that in the future body’s such as the PAC/PASS would be granted the right to have a degree of control over anglers wishing to fish for Pike and be in a position to licence anglers as being competent to fish (after an appropriate angling assessment), and venues would forbid any angler to fish who was not in possession of such a licence! Such regulation would have no effect on the majority of Pike anglers who would willingly submit to assessment; it would however filter out the inept Dangerman types who cause our sport so much harm! Some anglers see a chap in camouflage clothing with a bank of rods, alarms etc and assume (wrongly) that the person is a competent angler. This scenario was clearly demonstrated by Dangerman and his crass ineptitude! Having all the angling bells and whistles does not cure the problem it merely disguises it, what is lacking in all these Noddys is a basic understanding of a Pikes anatomy, its habits and it’s vulnerabilities coupled with no idea of the basics of elementary angling! It used to be the case that a Muppet could be spotted at fifty paces as they stumbled on to a venue with their 7ft spinning rod, light line and no wire trace, not so nowadays they have the gear but not the required savvy that is the ever present partner of the competent angler! I’ve said it many times before if you can’t understand the basics, no amount of fancy alarms or tackle of any kind will make up for this shortcoming! Knowledge is power if you don’t have it then you have nothing! Some forward thinking angling clubs in an effort to combat Dangerman type handling have Pike teach in sessions which must be attended by any angler desiring to fish on their waters. http://www.farnhamanglingsociety.com/species/pike.php Implementation of such schemes would certainly educate some of the ninny’s we encounter, but the scheme is heavily dependent on manpower and time, and as such is problematic for many clubs. I feel that licensing bodies mentioned earlier should also have the power to eject errant anglers if it can be shown that they have seriously deviated from their prescribed guidelines. It may seem a bit over the top and heavy handed just now but mark my words, in time this will become the norm and for me it can’t come quickly enough! The buds of such policies are now emerging in all manner of sports it is my hope that such a situation will become part of angling in the near future! A police state/big brother watching you? No just weeding out the dross that drag our sport down into the murky depths and allowing real anglers with an assessed degree of competency to enjoy their sport! Angling in one respect is quite different to many others in that a live being is the object of the sport whereas in many others it is not! It’s acceptable to be reckless on a computer game because your actions will not hurt another they are of no consequence. In angling your quarry will be put at serious risk because of your irresponsible actions (watch the Dangerman video for numerous examples)! Such reckless behaviour is unacceptable because the Pike is not your equal! It does not possess human thinking abilities it is inferior in mental and physical capability, and common decency demands that the captor treat the fish with the greatest of respect by doing the opposite of what Dangerman does! The Geneva Convention in earlier wartime was formulated on this thinking and although this is a step into anthropomorphism the principles are in any decent anglers mind transferrable! Buckfast swilling Noddys, fire raising neds, hardened litter louts and zombie like non thinking “anglers” such as Dangerman have no place in modern angling! These varlets are but trash worthy only of scorn and immediate corrective action! The art of real angling is a character building journey through life during which the angler learns respect, compassion, empathy and is not only confined to the art of catching fish but engaging in the wider field of angling taking in the whole spectrum of wonder all around him and the contemplation of all that is offered to him! The camaraderie found amongst real anglers is instantly recognisable and is one of the higher rewards available to an angler. Not everyone is capable of becoming a real angler as the previous writings on the actions of Dangerman clearly show; to become a real angler one must put something into his sport in order to get something back! This is demonstrated by the “plastic” Pike angler who need only turn up at his venue fish anywhere throw out any bait and daydream until the inevitable take occurs. No thinking is required in such situations and the numerous catches of artificial ballooned out soft and flabby Pike give nothing like the sense of elation felt by the real Pike angler in pursuit of his wild quarry! The future of angling is being formulated now, and anglers have an opportunity to shape it into a sport that demands respect from others. Currently angling is often in the media for all the wrong reasons, to remedy this corrective action is required now! Turning a blind eye to the activities of these knaves is not an option if angling is to progress! Noddys such as Dangerman undoubtedly set us back and do cause serious damage, but the body of real angling amounts to more than all these imbeciles and by removing them we can make angling the sport we all wish to enjoy! So put yourself out, make a few waves, challenge each and every Muppet and lay the foundations for a new more professional research based angling which will be to the betterment of us all! Each and every Muppet loose on a lochside and allowed to go unchallenged places our sport in jeopardy! All riparian owners have now received a copy of the report from the Wild Trout Trust and we will revisit them in a couple of weeks to see what their views are! Unbelievably St Marys Loch has started to freeze over again midweek with the area below Bowerhope being completely frozen with the odd patch of ice elsewhere. The bottom third of the Lowes has frozen over but the remaining two thirds of the loch remains open. A most unusual state of affairs as usually the wee loch freezes over completely well before St Mary’s succumbs! As of today (Sunday both lochs are completely open. Click the above link to find out how NOT to handle Pike; the perpetrator (Kevin Austin) of the shocking handling in the video has been barred from fishing at our lochs! Have a look at the video and the dopey comments below, he has removed 23 comments from the video all 100% negative (mail us if you would like to view them). Please download his photo and pass it on to your venue and ask them to visit our news pages to read about a disgrace to angling and a Pike mutilator. 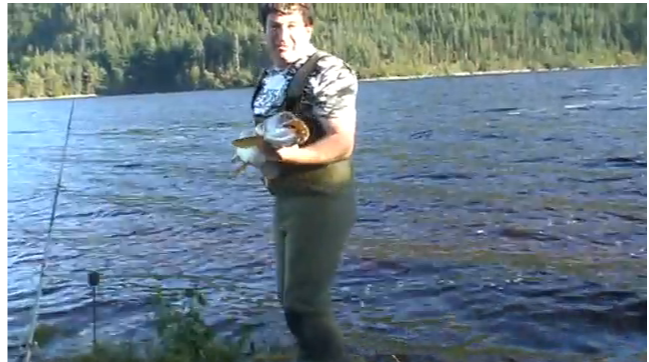 Would you really want this fool with his appalling handling skills fishing at your loch?